Where are you from? Your profession? We live in Saugerties, NY. Frank is a retired electrical engineer from IBM and tech guy at BOCES vocational school. Barbara is a retired special education teacher. When and how did you become interested in paddling? We both became interested in paddling when a friend took us out on the Hudson River and other local creeks a few times. We knew we wanted to try more of this. We love the water. Where is your favorite place to paddle? Barbara's favorite: There is nothing more beautiful than the clear light blue waters of the Florida Keys. Frank's favorite: Merritt Island National Wildlife Refuge in Titusville, Florida for the wildlife- birds, manatees, and dolphins. What’s the most interesting thing that ever happened to you on a paddling trip? Frank: Paddling with alligators, manatees, and dolphins. Also paddling the locks on the Erie Canal. 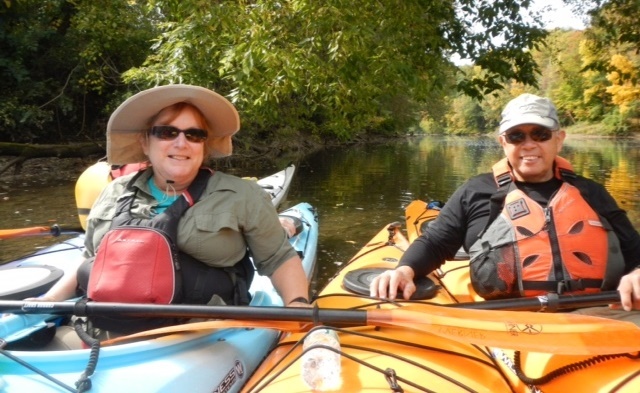 Barbara: Paddling seven miles on the Hudson River to the Esopus Meadows lighthouse in the middle of the river, docking on their floating dock, touring the light house, then getting back in our kayaks to paddle home. The waters were rough so getting out was challenging. How many Paddle Florida trips have you gone on and to where? We have been on two Paddle Florida trips: The Wild, Wonderful Withlacoochee in 2014 and the Dam to the Bay trip on the Ochlockonee River in 2015. What keeps you coming back? Paddles are well organized, adventurous, and bring us to places we've never been. They attract great people—it’s fun seeing with people we’ve met before, meeting new people, and we enjoy the friendly staff. We also love that everything is taken care of and planned for us--campsites, food, hauling our gear, entertainment, and shuttles. Can you describe a Paddle Florida trip highlight? On the Withlacoochee River trip, we paddled with the pre-arranged guide up Gum Slough to the springs where we swam and had lunch before returning to our campsite. Meeting the owner of the property around the spring at the end was particularly interesting. What advice do you have for folks considering a Paddle Florida trip? Just do it! You are well taken care of and totally supported. On our first trip, we worried about the number of miles in one day and whether we’d be able to do it or keep up. That's not to be a concern. It's at your own pace and all levels of paddlers are there.